Finding a place in New York to smoke a cigar has become tougher than stumbling upon an ax-throwing competition at a Brooklyn bar. Dare to light up a stogie in a New York park -- where smoking has been outlawed, anyway -- you’ll get nasty looks from sunbathers and stroller-moms in the park. Onerous city codes and prohibitively expensive ventilation systems make neighborhood lounges hard to come by. And just try smoking out the window at someone’s housewarming party. Nah, in this town, in the 21st century, you’re going to need a dedicated place to smoke. In plenty of spots, you can drop $25 for a stick and a dash of ambiance. But as long as you’re engaging in this slow manner of financial suicide, you’ll want to spend it in the best possible spot. Finding the best of those shops means appreciating the history of cigar shops as places of spontaneous convocation, with their own sooty personality and charm. In the collective imagination of New York cigar smokers, the platonic ideal was OK Cigars, which cigar fans recall with an almost mythological, romantic affection. “At OK, we were surrounded by artists,” says Ryan Rodriguez, who worked at OK for almost all of its 17 years on West Broadway. “The fact it was SoHo, and it was all artists and designers, we had the opportunity to sit down and talk to them. It was a window into their world -- and the one thing you had in common was a cigar.” The shop closed in 2014 to make way for Free People, “an American bohemian apparel and lifestyle retail company,” i.e., paradise was paved to put up a parking lot. Today in New York, you’re likely to find a lounge experience in look and feel more akin to the Delta Sky Club at LaGuardia than the Salon de Paris -- while smoking next to someone more Jordan Belfort than Pablo Picasso. It wasn’t always so. “What you had then was a cafe society type of thing. You had friendship, meeting new people, conversation -- that’s what I loved about New York City,” says Lee Ringelheim, owner of SoHo Cigar Bar. It may not be the age of enlightenment, but if you know where to look, New York still provides refuge to cigar devotees of every stripe. Here are nine New York City spots where the culture still burns bright. Nat’s retail catalog dives deep, with a humidor full of select Davidoff facings, sticks by Foundation Cigars, and of course the Nat Sherman line. But the family-owned and -operated tobacconist was acquired by Altria early last year and has been subtly corporatized ever since. Guests are discouraged from smoking on the retail floor, and the bathroom access was abruptly restricted to members only -- a privilege that comes with a $3,000 annual price tag. Membership also includes access to the lounge in the basement of the Nat Sherman town house, a humidified cigar locker, a smattering of club chairs and ottomans, Restoration Hardware nailhead sofas, and seating for about 70 smokers. But rather than paying strictly for access, membership acts as a product credit, allowing you to dig into your prepaid $3K for anything in the store. Blow it in one shot on that Elie Bleu humidor you’ve always wanted, or on one stick at a time over 12 months. The Lounge has limited hours, but it’s perfect if you work around Grand Central and have a few hours to kill before the 6:53pm Metro-North to Darien. Davidoff is successful as both a luxury premium cigar brand and lounge operator for two reasons: investment, and standardization. The Swiss-based multinational premium cigar maker has expanded its cigar portfolio through manufacturing and acquisition. Beautiful, meticulously crafted smoking rooms elevate the experience here. Davidoff has retail lounges in Manhattan, with a fourth slated to open April 1 in Williamsburg. The Manhattan lounges’ vibe might be more reception area at an Upper East Side dentist than La Belle Époque. But they’ve developed successful, highly serviceable lounges with their consistency of design. Furniture and fixtures by Germany’s Walter Knoll and Poltrona Frau make for a tolerable time, even if Jim Cramer screams from a 60-inch plasma TV and a loud talker ashes all over his Kiton suit. As owner Lee Ringelheim likes to put it, it’s “a bar you can smoke in.” SoHo Cigars offers an impressive complement of whiskeys and cocktails -- starting with a $13 Monkey Shoulder whisky blend and topping out with a $300 30-year Macallan. 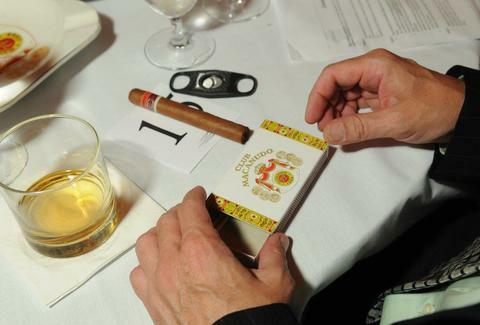 Its cigar menu is equally varied. You’ll find house blends introduced three years ago, Padron’s 1936 anniversary series and Davidoff’s W Churchill Late Hour -- a $36 bourbon cask-aged Nicaraguan blend. Paintings of Ol’ Blue Eyes and Jack Nicholson watch over the space and Dave Chappelle has been known to haunt the dimly lit smoky environs. Ample seating in the front is prime real estate for catching the NCAA playoffs or Yankees games. Plush leather booths in the back accommodate the eclectic nightly mix of locals, tourists, and curiosity seekers who don’t mind smelling like Castro’s beard. 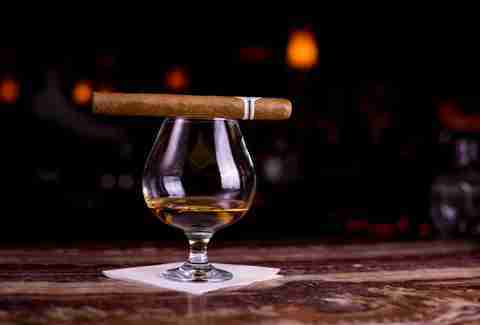 Most regulars pay a one-time $10 fee to bring their own cigars, but the dues are waived with an easy-to-reach $25 food or drink tab. Getting Top Secret security clearance in the Trump administration may be easier than landing a membership to this bastion of libertine joy. 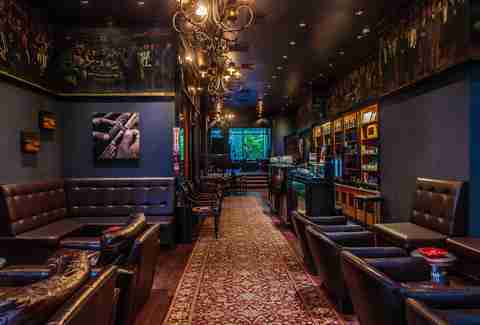 The members-only club, situated in the penthouse of Jared Kushner’s 666 Fifth Avenue, is a mecca for cigar smokers. A cast of New York City scions and power brokers traipse through for sweeping Midtown views and the faint endorphin rush the likes of which only deep exclusivity can bring. Management keeps fees and membership information under wraps; current and former GHR members say dues can top $20,000 a year and the board approval process rivals that of a selective Manhattan co-op board. With limited space and months-long waitlist, legend has it that a membership once sold for $150,000 on the secondary market. Luckily, even hoi polloi can have friends in high places. So, if graced with an invitation, cancel your wedding, cancel grandma’s funeral, postpone that major surgery and go. Floor-to-ceiling windows, a formal dining room, and full-service kitchen turning out a menu worthy of any restaurant in the zip code; it’s 17,000 square feet of paradise for the smoker. Little sister to the East 53th Street Casa de Montecristo retail lounge, Cigar Inn is the better of the two formerly family-run businesses. 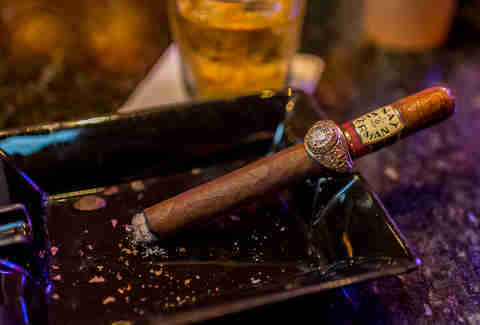 Open till midnight on weekdays, this is your best, if not only option for a late-night cigar. It isn’t a bar like SoHo or an experience like Havana Room. It’s a cigar shop where you can smoke, great if you don’t mind the almost comical lack of ventilation. This comfortably decked-out space boasts a respectable selection of cigars, and the recent addition of a large reclaimed wood conference table makes this a rare place where you can get some work done, hunkered with a laptop and a stick. Part of the Hospitality Holdings portfolio (Empire Rooftop, Lexington’s, The World Bar) Carnegie does corporate better than other big operations. The joint still feels authentic, harking to a time when we didn’t know as much about smoking’s risks. Sinatra Saturdays with Steve Maglio and the Stan Rubin Orchestra drive home the aesthetic without veering into caricature. Tufted sofas, club chairs like a mother’s embrace, and a leather-bound library give Carnegie a hazy Campbell Apartment vibe. Two floors of lounges and high ceilings make for better ventilation than some cozier competitors. They’ll waive their $10 cut fee with proof of purchase from Davidoffs so you can save some expense account dollars before that client dinner at Nobu Fifty Seven. Smoking in New York City parks, pedestrian plazas, beaches, golf courses, or just about anywhere seemingly conducive to lighting up was outlawed in 2011 under then Mayor Michael Bloomberg. So when the temperatures start creeping above 65, and you’re craving the warm caress of an afternoon outdoor smoke, give thanks to the work of the Paley family. A family affinity for smoking dates back to the 1800s. Long before massive radio and television success, the Paley family business was tobacco. In 1967, CBS Television founder William S. Paley’s namesake foundation transformed the site of the former Stork Club into a model for publicly owned private spaces. Conveniently located down the block from Davidoff’s Madison Avenue flagship, Paley Park is replete with a 20-foot waterfall, tables, chairs, and stunning vertical landscaping. The park is a cigar smokers’ sanctuary. Anyone who might look askance will be surprised when, as you light the foot of your mid-afternoon smoke, a park employee brings you a clean ashtray. Club Mac, as it’s referred to by its white collar regulars, is an elegant throwback for the smoker in search of comfort and service. Nestled on the ground floor of The Leonori -- a beautiful turn-of-the-century Beaux-Arts building on the Upper East Side -- the tony lounge boasts rich mahogany accents, a formal dining room, and brass plaques engraved with the names of members past and present (e.g. former California Governor Arnold Schwarzenegger; one-time kindergarten cop Rudolph Giuliani). 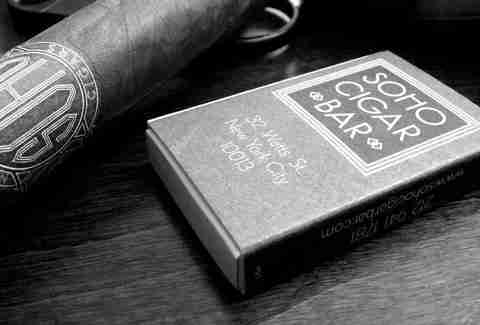 Their cigar menu is abundant, stocked with items from the General Cigar family of products. (Macanudos, CAO, Partagas, Punch). Order from the humidor and smoke in this white-glove service environment for as little as $15 (there is a $30 table minimum, so bring a friend or smoke two). Or bring your own and pay a $15 cutting fee and fulfill the table tax with items from the full bar or dinner menu. Sure, Macanudo is peddling a kind of fauxclusivity, but this is where the everyman can experience a diluted version of Grand Havana’s mystique without the pricetag. Non-members can visit Macanudo’s bar and dining areas, where vaulted ceilings and a top-notch ventilation system leave the air virtually smoke-free. In the event, unlikely as it may be, you should find yourself in Rego Park, pop into Havana Dreams. Tidy and nondescript, it doesn’t look like much from the outside. But this is as close as you’ll come to the neighborhood cigar shop of yore. It’s a hangout in every sense. While tobacco behemoths spend millions of dollars building out luxury retail lounge spaces, this mom-and-pop shop instead favors true community. The furniture may not be Le Corbusier -- but who cares? The place isn’t designed for Architectural Digest. It’s just a joint. Twenty leatherette club chairs, two flat-screen TVs usually set to sports, a fridge filled with beer and wine, a comfortable backyard, and a video poker machine in the corner? Take that, Nat! The humidor has a surprisingly well-curated selection of cigars you’d see in any of its more luxe retail counterparts -- and some you wouldn't. LFD Andalusian Bulls are proudly displayed near the door, and you can pick from a rich selection from the Padron 1926 series, The T by Caldwell, and the full Arturo Fuente Don Carlos line. The guy at the video poker machine may not be much for conversation: If you’re looking for the age of enlightenment, keep prowling. But it is inviting and, most important, uncomplicated. 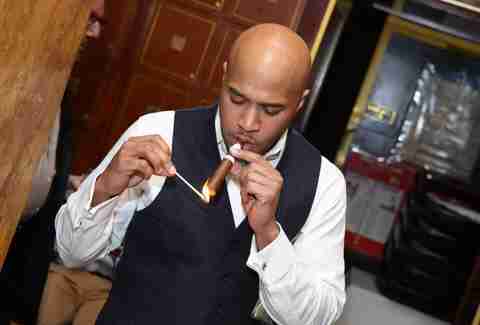 Joe Marino is a cigar smoker.